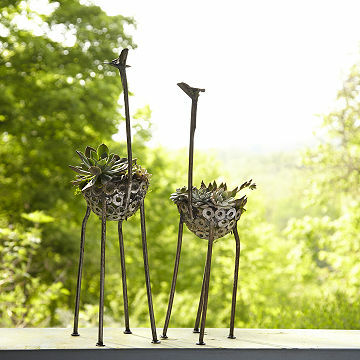 Adorn Kenyan Tom Ateto's unique, recycled metal giraffe planters with small succulents or other plants. Ancient Egyptians captured African giraffes and rafted them down the Nile for their rulers to keep as trophy pets. The origins of these African planters are decidedly more humble. Starting life as scrapped washers, nuts, and other metal pieces, they're salvaged and welded into one-of-a-kind giraffes by creator Tom Ateto and his team of Kenyan artisans. Designed to be adorned by your arrangement of small plants and/or succulents, these charming herbivores can also hold keys inside your entryway, or serve as eye-catching catchalls—a raft of uses, if you will. Handmade in Nairobi, Kenya. Tom Ateto and his small team of talented sculptors work in an old British barracks outside of Nairobi, Kenya. Heaps of used machine parts come into their studio as raw material. After the group transforms them with their sculpture magic, what was formerly junk goes out the door as personality-filled outdoor works of art. Large planter: 26" H x 7.5" Dia. x 2.5"
Wipe clean with dry or damp cloth. Planters may develop rust or patina over time. You can spray them with a clear spray paint or sealant to help preserve the original finish. Measurements are of bowl and height of planter from feet to top of head.